I know I’m a little late to the party, but I’ve just discovered the beautiful world that is the art of Simon Stålenhag. His work has been covered extensively over the past few years but I couldn’t resist sharing it with our PixlParade audience. The apocalyptic universe he created has pulled me in and left me wanting more; the ominous nature of ruined robotic monstrosities peppering the landscape begs the question, “What happened here?” This is an alternate time line universe that is clearly set in the distant future but in some ways also maintains the familiarity of the 1970s, 80s, and early 90s. (Just look at some of the cars!) The more of the artwork I looked through, the more I couldn’t help but feel that this universe deserves to come alive in the form of a book or television series, or best yet, a video game. Some depict a world filled with “War Machines” broken down and out of commission. A world that has survived a war that took place on a scale that we couldn’t possibly imagine. But life goes on; the human race picked up the pieces and rebuilt. And everyone lived happily ever after and had plenty of electricity for totally non-dystopian activities. And here’s some nice highway workers wearing … what are those things? Eh, it’s probably just some neat new innocent technology. See? Everyone’s having a great time. Oh that’s weird, what are these things doing walking through the neighborhood? Probably just stopping by to say hi! Hello! This is totally normal! Look a parade! … Uhhh, what’s going on here? Ok, something definitely isn’t right here. I’m not scared! You’re scared! 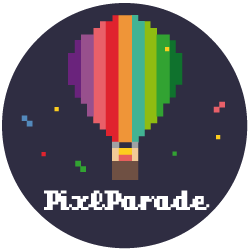 Eva is the founder and master puppeteer behind PixlParade! She delights in all forms of digital storytelling, and is often awestruck by the wonders that humans create everyday. The zany little seed known as PixlParade was planted when she attended the Art Car Parade one year in Houston. Each car was marvelous and unique, showcasing the talent and moxie of artists across the globe. Energized by the experience, she gathered like-minded individuals and launched PixlParade. Beyond the digital world, Eva loves hiking, gardening, dancing, and going on epic adventures with her dogs.